If you are a reader of this blog, you probably already know that one of my goals is to learn large format (LF) photography this year. By ‘learn’ I don’t mean to become expert in its use. I’d be a fool to say that, given that some incredible photographers have spent a lifetime mastering this art form. What I’m trying to do is determine whether a view camera has a role in producing the kind of prints that my clients are increasingly demanding; really huge prints that are crisp and clear and vibrant. I’m trying other techniques, but LF is currently my main focus, so to speak. I also promised to keep you all updated on my progress. Now, I’m the kind of guy who digests as much as possible from books and articles. But, when it comes down to the nitty-gritty, I learn best from a mentor and from actually putting pedal to metal and trying things out. Fortunately, for anyone wanting to get into LF, I found a terrific resource in Fred Newman, owner of The View Camera Store (www.viewcamerastore.com). Fred has not only been selling this stuff for years, but he’s an accomplished LF photographer himself. That’s an unbeatable combo in my mind. After fiddling around for two months near my home, I was ready to test my skills in the American southwest. One thing I was having trouble with was the focusing hood, which is the cloth that a LF photog throws over his head to focus the image on the glass screen. As it turns out, The View Camera Store offers the BTZS Focus Hood. I tried it out in several national parks around Albuquerque and I’ve got to say that hood is the best thing since sliced bread. I had been frustrated by other well made, but cumbersome hoods. The BTZS is simple, very well made and dual function. When carrying my camera on my tripod, I use it as a protective cover. While focusing, its long Velcro closure allows me to manipulate it to shut out as much light as needed. It works even in the brightest southwest light. Fred has a straightforward video explaining its use on YouTube, this one for a 4x5 view camera like the one I use. 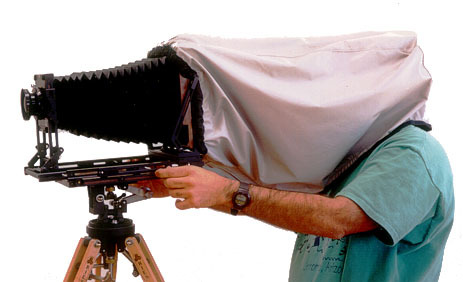 However, his store sells hoods for any size view camera. Fred spent as much time as I needed on the phone with me advising me on other issues, such as loading and unloading my film out in the field. By time I left on my trip, I felt confident that I had a handle on my workflow. I have no financial or other relationship with Fred or The View Camera Store.